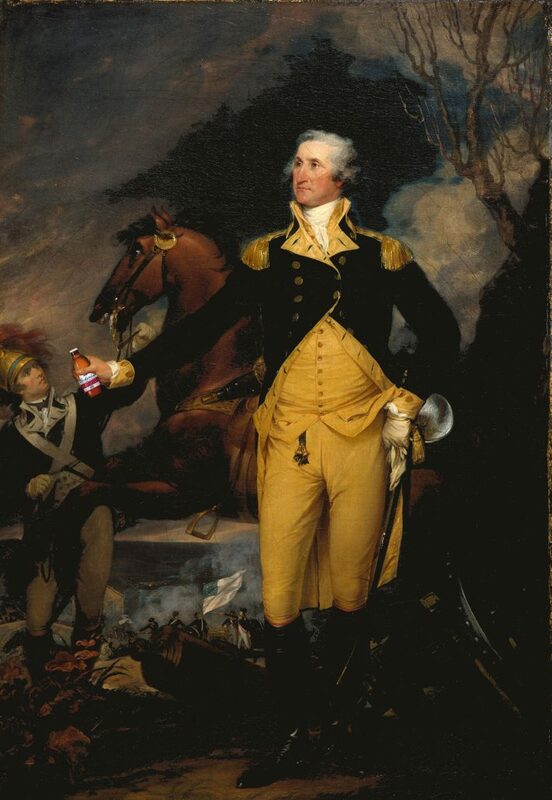 Inspired by a hand-written recipe uncovered in George Washington’s journal kept during the French and Indian War in 1757, the brewing behemoth has brought Washington’s beer back to life in the form of Freedom Reserve Red Lager. Described by Washington in his journal as a “small beer,” the 5.4% alcohol Red Lager is brewed with toasted barely grains that emit a subtle sweet aroma, a splash of hops, a rich caramel malt taste, and a smooth finish with a hint of sweet molasses. George Washington. 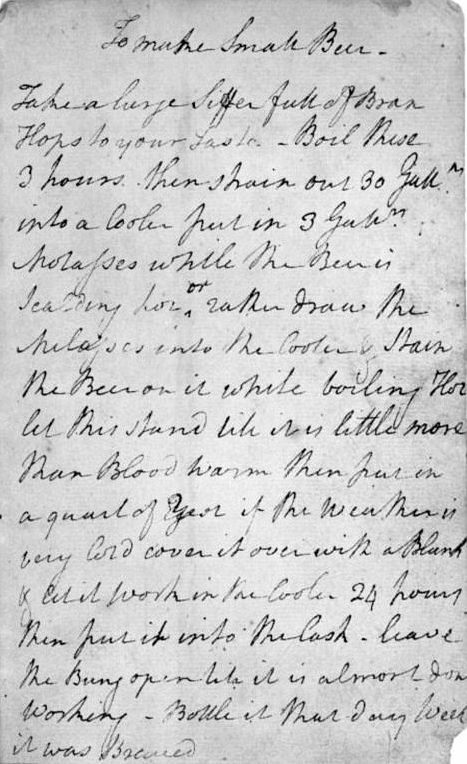 “To Make Small Beer.” From his 1757 notebook. 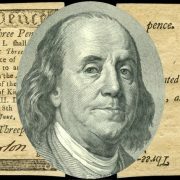 George Washington Papers, Manuscripts and Archives Division, The New York Public Library. Take a large sifter full of Bran Hops to your taste – boil these 3 hours. Then strain out 30 Gall. into a cooler. Put in 3 gallons molasses while the beer is scalding hot or rather drain the molasses into the cooler. Strain the beer on it while boiling hot. Let this stand til it is little more than blood warm. Then put in a quart of yeast if the weather is very cold. Cover it over with a blanket. Let it work in the cooler 24 hours then put it into the cask. Leave the bung open til it is almost done working – bottle it that day week it was brewed. Created to celebrate American history and veterans, the Red Lager is brewed by Budweiser’s “proud veterans,” the company says. A portion of proceeds sold will benefit Folds of Honor―a nonprofit that provides educational scholarships to the children and spouses of our fallen and disabled service members while serving our nation. This isn’t the first brew inspired by Washington’s recipe. Blue Point Brewing, a New York craft brewer acquired by Anheuser-Busch in 2014, brewed up its own batch of Washington’s beer two years ago. Colonial Ale – An American Brown Ale, used the same recipe, from the same journal as Budweiser used to create its Freedom Reserve Red Lager. In addition, Yards Brewing of Philadelphia has brewed George Washington’s Tavern Porter, inspired by Washington’s recipe, since 1999. In addition, their “Ales of the Revolution” series also boasts brews inspired by recipes from Thomas Jefferson and Benjamin Franklin. A strong Golden Ale, the Thomas Jefferson’s Tavern Ale is based on the recipe Jefferson used to brew beer at his Monticello home. Poor Richard’s Tavern Spruce is based on Benjamin Franklin’s original recipe, which called for barley, molasses and essence of spruce. John Trumbull’s, “George Washington before the Battle of Trenton,” ca. 1792. If you’re interested in Budweiser’s Freedom Reserve Red Lager, it will be available now through September 30th or while supplies last. And in true ‘Merican form, Budweiser worked a deal with alcohol delivery service Drizly to deliver a taste of history to new Drizly customers across America. If you want this brew delivered to your front door in under an hour, use special promotion code “Freedom” to save $5 on your first purchase. The offer is valid from May 1 through July 15. 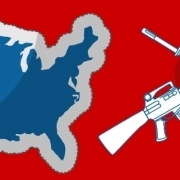 Only in America! Pepperbox Pistols: Last Line of Defense Inherited a Collection? Now What?